During the summer we skate/bike/and/or stroll weekly at the Glen Rock Duck Pond in Glen Rock. Meet new people! Learn new skills! Drop those unwanted extra pounds! It’s so much fun that you won’t even realize you’re exercising! Skate, bike or stroll all or part of the over ten miles of trails, moving along at whatever speed you feel comfortable with. Along the way we regroup at the bridges as we rest and chat. 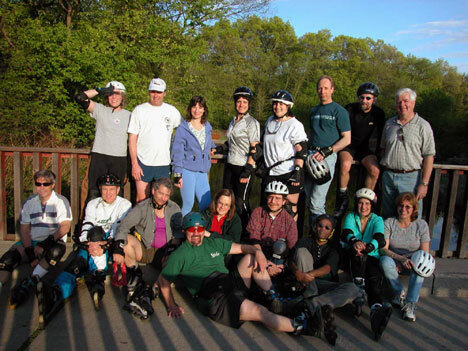 Come and join the “Garden Skaters” on Wednesday of every month beginning in May, as we roll along a beautiful wooded trail which winds its way through six Bergen County towns. There’s no better way to unwind from a stressful day than to breeze down the trail with friends, wind in your hair, sunlight shining through the trees! BUT WAIT! THE FUN’S NOT OVER! Work up that appetite because after skating, biking or strolling, we all go out to dine alfresco at The Office in Ridgewood. We meet at 5:30 P.M. every Wednesday of the month beginning in May at the Lake at Glen Rock part of the Saddle River Park system. The entrance is off Prospect Street. Turn east onto Alan Ave in Glen Rock. We park at the largest lot which is furthest from the trail head, north side of the pond. After a quick gearing up we usually hit the trail around 5:45 p.m. for approximately one hour. The start time will be adjusted weekly to accommodate the earlier sunset. Please add your name to the mailing list by emailing Ron for the actual start time. Protect your most valuable asset: WEAR A HELMET! And don’t forget the wrist guards. Knee and elbow pads also come highly recommended. Be informed of all of the latest skating info, including last minute date or time changes by checking our calendar and Facebook site. Joining our email list by emailing president@gardenstateskiclub.com to sign up for our Lift Line.